Amenities: Crown Bay offers a roof-top deck, barbecue and gym. Other: Crown Bay is across the street from Gaslamp Quarter Park, a small park big enough for dog walking, book reading or a picnic. A great steak house restaurant is located in the buildings street retail section. 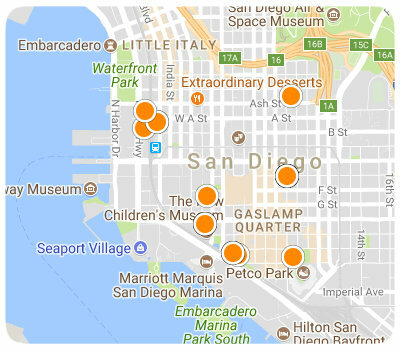 Like the most: Crown Bay residents love being so close to the Gaslamp's shopping and restaurants. They also like the low HOA fees, one of the lowest downtown. This building faces a small park (Gaslamp Quarter Park, a small park big enough for dog walking, book reading or a picnic) across the street. Like the least: Some of the residents feel there is not enough storage space inside the units.